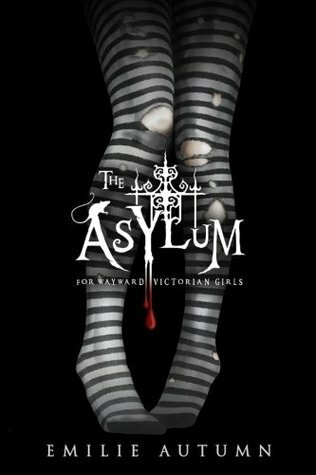 The Asylum for Wayward Victorian Girls, by Emilie Autumn – I believe I obtained this as a free eBook, which is good because I hear it was previously only available in an expensive and barely edited hardcover. I understand Emilie is trying to launch a musical based on it, and is using this as promotion. I quite like her music, so I thought this would be worth checking out. It’s partially an account of her stay in a mental institution after a suicide attempt, and partially a totally fictional tale of poorly treated patients in an asylum in Victorian England. Emilie presents the parts about her as excerpts from the journal she kept while institutionalized, and the other story as something that appeared in said journal when she wasn’t looking. The main character in this part is an analog of Emilie named Emily (with a Y), and I believe some of her fellow inmates were also based on people she works with. Veronica was presumably named after burlesque dancer Veronica Varlow, whom I recently saw perform with Kim Boekbinder; and she’s had two different backing performers called the Captain. Emily ends up in the asylum after defending herself against a noble patron who molests her, and she and the other patients learn about a plot to use the inmates as prostitutes, and another one by a mad doctor who wants to infect them with the plague in order to find a cure. I’m sure shady things happened in Victorian asylums all the time, but the one described here was over-the-top in its corruption. Eventually, the inmates take over the asylum. This book is very polarizing; I’ve checked the GoodReads reviews, and there are a lot of really positive and really negative ones. I was generally more sympathetic to the negative ones, even though I thought the book was a decent read, and I think some of the reviewers went too far in their condemnation. The thing is, in the allegedly autobiographical segments, Emilie comes across as rather entitled and unlikable, fat-shaming and making disparaging comments about other patients. If we just take these as reflective of her state of mind at the time, it’s understandable; but it’s complicated somewhat by how the book ends with some fairly lucid, astute observations on mental illness. If she was able to think more rationally about her experience later on, would it have been all that difficult to apologize for some of her meaner moments? While I’m sure mental institutions really are uncomfortable, non-forthcoming about treatment, and prone to drive someone mad even if they weren’t when they were committed, we have to remember that: 1) they’re underfunded, and 2) there’s a lot we don’t know about the workings of the brain. It seems like a lot of treatment for mental illness is done in the method of throwing things against the wall and seeing what sticks, and I feel bad for the people who have to be subjected to this, but it’s probably largely unavoidable. To imply things haven’t changed much since the Victorian era is…well, not something I’ve studied, but likely not entirely fair, even if there still is a lot of stigma attached to mental conditions. I know Emilie mixes fact and fiction when giving information about herself to the point that we don’t entirely know what’s true, and that’s fine in and of itself; I appreciate artists who can craft far-fetched biographies and absurd images. What’s less fine is when someone uses this to address an actual social issue like the treatment of mental patients, when there’s no way of knowing how much of the story is even true. The blurb for the book claims that it ” has been cited in text-books used as part of the psychology curriculum at Oxford University in London,” which I’m pretty sure is completely false. The eBook in particular is somewhat of a multimedia production, including hyperlinks and puzzles. At various points in the narrative, there will be a link to a song, protected by a password that’s an anagram of bold letters from preceding pages. It’s any interesting idea, and I did manage to solve a few of them, but I mostly just found myself searching for the answers online so I could move ahead with the thing. I’m reminded of how the DVD of the first Harry Potter movie made you play a game just to access deleted scenes. The songs are a mix of old ones and newer stuff for the intended musical, and I quite like them, which made reading the book a better experience overall. 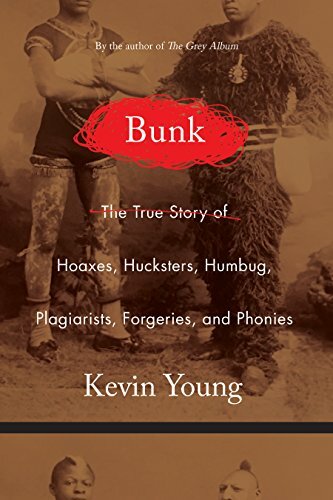 Bunk: The Rise of Hoaxes, Humbug, Plagiarists, Phonies, Post-Facts, and Fake News, by Kevin Young – This was a Christmas present that I just finished reading, and it’s a fascinating read, but kind of all over the place in what it covers. That’s not really bad, but it makes it difficult to sum up the whole thing. Young comments on various hoaxes throughout history, starting in the time of P.T. Barnum and continuing to the present. These include plagiarized works and falsified memoirs, including the Howard Hughes biography and the Hitler Diaries, as well as more recent fakes like James Frey and Rachel Dolezal. One theme running throughout is that of race, how many hoaxes of the sideshow variety were based around the notion of non-white people as mystical and exotic yet still lesser, and how more recently it’s often a case of people making up stories that perpetuate racial stereotypes. It was interesting that the fake rumor that white people were beaten up just for going to the theater to see Black Panther came about as I was finishing this. Other people sold work by claiming to belong to minority groups that they really didn’t, or just making up stories of encounters with exotic cultures. Young frequently comes back to the idea that, while it’s easy to dismiss such forgeries as harmless fun (and, indeed, many of them are rebranded as fiction once the falsehood is uncovered), they can belittle the experiences of others. Another point made is how hoaxers often include clues in their work as if they really WANT to be found out, and are frequently quick to denounce or expose others doing the same basic thing. Barnum, for instance, wrote a book called The Humbugs of the World while still perpetuating his own humbug. But another part of Barnum’s appeal, and that of others who have followed him, is that they make anyone who is able to see through the deception feel smart. Young considers this aspect to be less common in the modern age, with people like Donald Trump more or less suggesting that the truth is totally irrelevant, rather than just something that can be played with. It’s interesting that I started reading this when already in the middle of the Emilie Autumn book, since I can see some elements of the hoax present in that. For that matter, there was a movie about P.T. Barnum released not long ago, and the trailers made it seem like they were presenting him in a positive light. I haven’t seen the movie and know trailers are often terrible representations, though, so maybe that’s not accurate to the film as a whole. This entry was posted in Book Reviews, Current Events, Health, Music, Prejudice and tagged bunk, donald trump, emilie autumn, fake news, forgery, hoaxes, james frey, kevin young, mental illness, p t barnum, plagiarism, rachel dolezal, racism, the asylum for wayward victorian girls, veronica varlow. Bookmark the permalink. Your review of Emilie Autumn’s book sums up my thoughts about the “autobiographical” chapters almost perfectly. I have been in an inpatient psychiatric hospital twice. And while I am not a not a clinician, I have a bachelor’s in Psychology and studied Clinical Mental Health Counseling for three years at the graduate level. (Sadly, my mental health effected my academic performance and they permanently dismissed me…) State-funded psychiatric hospitals tend to be underfunded and understaffed. People omitted involuntarily often face police brutality. Mixed gender units are a thing. Restraints may be used. A lot of items are taken away, for good reasons relating to safety and privacy, but comforting items can often be taken away. (I wasn’t allowed to keep my slippers once because the nurses were worried another patient would eat the sequins off of them?) Based on my experiences, and stories I’ve heard from friends, I have no problem believing the majority of what Emilie wrote of her personal experiences. And a lot of was terrble. But we have come such a long way in the last few decades, much less since Victorian England! I know that in my state, a significant reason for our homelessness problem is because closing mental institutions- while cruel and restrictive to patients- put thousands of mentally ill people on the street with no where to go. And seeing as she’s had time to reflect on her hospitalization- and has made several changes to the story since it’s initial publication- she would be a little more contrite and show more self awareness. But I’ve been reading negative reviews of this book for years while waiting for the book to become more affordable, and I expected it to be a lot worse than it turned out to be.